Concordia Hospital, Winnipeg, Canada, was founded on 1 January 1928, when at a meeting of a number of refugee students from Russia, it was resolved to found a Mennonite hospital in Winnipeg. When the Mennonite groups of Manitoba proved responsive to this idea, an appeal was made to the youth organizations of Canada and the United States in March of the same year that they assist in the realization of this plan. The result was that in a short time a considerable sum of money came together but it did not suffice by far for the opening of a regular hospital. Therefore it was resolved to begin with a maternity home. For this purpose a private home was rented on 291 Machray Ave., and the necessary equipment was bought. In the end of June the home with five beds was officially opened and the first maternity cases were admitted on 28 July 1928. The home was founded with the purpose of turning it over to the Mennonites once its need had been realized. The opportune moment seemed to have arrived in 1929, when at the meeting held on 21 November, six members of the Mennonite churches were elected to the enlarged council. The meeting instructed this enlarged council to found a regular hospital. As the required monies were provided by personal loans, the transference of the maternity home to a house on 720 Beverley St. was possible in 1930, at which time it began to function as a regular private hospital. Until the year 1932 the hospital flourished but then the worldwide depression also hit Concordia. The people became too poor to seek medical attention or avail themselves of hospital care. To ameliorate this, a system of mutual health insurance was inaugurated which included doctor's care as well as hospitalization. 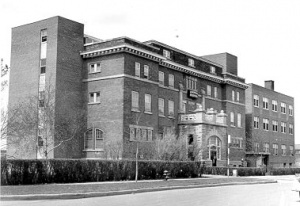 This system gave the hospital new life and made possible the purchase of the Winnipeg Sanatorium in Elmwood, to which the hospital was transferred on 13 April 1934. This system ended in 1958 with the introduction of public health insurance. In 1934 the hospital was recognized as a Public General Hospital by the provincial government. It had 50 beds and 16 bassinets, a well-equipped operating room, two obstetrical rooms, an X-ray department, and an up-to-date laboratory, all operated by the Mennonite Hospital Society Concordia in the 1950s. In 1965 land was purchased at Molson and Concordia Avenue. A 134 bed hospital was completed nine years later. The emergency room was redeveloped in 1986, and 60 beds were added 1992. The Concordia Place personal care facility opened in 2000. Concordia Hospital. "Concordia: a Brief Retrospective." Web. 5 July 2008. http://www.concordiahospital.mb.ca/content.php?pageID=183. Willms, H. J. and Sam Steiner. "Concordia Hospital (Winnipeg, Manitoba, Canada)." Global Anabaptist Mennonite Encyclopedia Online. July 2008. Web. 25 Apr 2019. http://gameo.org/index.php?title=Concordia_Hospital_(Winnipeg,_Manitoba,_Canada)&oldid=103276. Willms, H. J. and Sam Steiner. (July 2008). Concordia Hospital (Winnipeg, Manitoba, Canada). Global Anabaptist Mennonite Encyclopedia Online. Retrieved 25 April 2019, from http://gameo.org/index.php?title=Concordia_Hospital_(Winnipeg,_Manitoba,_Canada)&oldid=103276. Adapted by permission of Herald Press, Harrisonburg, Virginia, from Mennonite Encyclopedia, Vol. 1, pp. 667-668. All rights reserved. This page was last modified on 11 November 2013, at 06:16.